When we say you’ll get a comfortable night’s sleep when you stay in an Abodebed’s serviced apartment, we really mean it. In fact, we have just invested in new luxury Hypnos beds for all our apartments. Hypnos beds are all handmade with comfort and ultimate support in mind. The mattresses have health benefits too. They minimise the pressure points that aids your circulation and this, in turn, relaxes your muscles. Each pocket spring moves independently of the others, ensuring the mattress moulds itself to your entire body to support your back and ensure natural alignment. The mattresses are upholstered with natural fibres which are soft and breathable. Hypnos beds are ethically sourced, environmentally-friendly, and are 100% recyclable. In fact, the company has invested in a dedicated service which collects and recycles old beds and, as a result, is the first carbon neutral bed maker in the UK. The family-run company has won many industry awards, most recently, Most Highly Renowned Luxury Bed Company at the Lux Hospitality Awards 2016. Unsurprisingly, many luxury hotels have Hypnos beds, and a night in an Abodebed serviced apartment will now give you the same night’s sleep as guests at top London hotels such as Browns, the Corinthia, St Pancras Renaissance, the Lanesborough and many more… for a fraction of the cost! 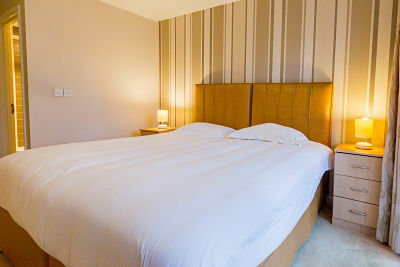 It doesn’t matter whether you’re staying in an Abodebed serviced apartment for business or pleasure, we want all our guests to get the benefit of a really good night’s sleep which will help you become more productive, better able to make decisions as well as being more energetic, happier and healthier.